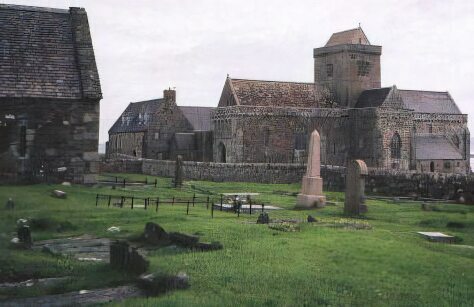 Malcolm III's brother, Donald Bane, or Donald the Fair, was born around 1033 and was made Mormaer of Gowrie in about 1060. On the death of his grandfather, Duncan he had been sent to the Hebrides. There he was subject to Celtic and Norse, rather than the English influences that his brother had experienced. On the death of Malcolm III and his eldest son Edward at the The Battle of Alnwick in 1093, Donald attempted to re-instate the traditional Gaelic tanist system of inheritance which had formerly been practiced by the MacAlpin dynasty of Scotland. He seized the throne at sixty years old ruling jointly with his nephew, Edmund, who was Malcolm's son by his second wife Margaret. Highlanders under Donald Bane surrounded Edinburgh Castle, where Queen Margaret lay mortally ill and the surviving sons of Malcolm Canmore had taken refuge. His intentions were to take his nephews prisoner, but they managed to escape his clutches. Donald despised Norman practices and began to reverse his brother's pro-Norman policies and attitudes. This engendered the opposition of William Rufus, the Norman King of England, who sent Duncan, Malcolm's eldest son by his first marriage to Ingeborg of Halland, into Scotland with an army to overthrow his uncle. He succeeded in unseating Donald Bane but was subsequently murdered leading to the restoration of his elderly uncle. An English force overthrew Donald Bane again in 1097, making Duncan's half-brother, Edgar, King of Scots. Donald Bane was imprisoned at Rescobie in Angus by his nephew, who had his eyes put out. He died in prison there in 1099 and was interred at Iona Abbey, the traditional burial place of the Celtic kings of Scotland, he was to become the last of his dynasty to be buried at Iona. Edmund later became a monk at Montacute Abbey in Somerset, it is uncertain when he died. Donald Bane left one child, a daughter, Bethoc, who married a Saxon thane, Ughtred of Tynedale. Their daughter, Hextilda, married Richard de Comyn, Justicar of Scotland, in around 1142. 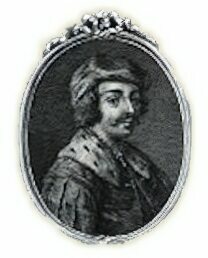 Their direct descendant, John Comyn of Badenoch, was one of the claimants to the Scottish throne during the Scots Wars of Independence that followed the extinction of the House of Dunkeld in 1290. He was later killed by Robert the Bruce.